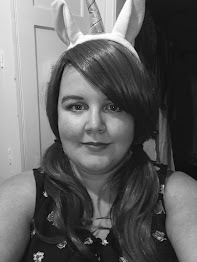 I've never done a Lust Have post before, but I've seen a few things recently, on various websites, that I have really fallen in love with, that I decided to put together this blog post in replacement of my Hottie and the Nottie post, which I've gotten (yet again) out of sync with writing anyway! From Pixie Footwear, the Poppy Fur Lined Boot is so adorable and perfect for winter as they look so warm, and with thick soles which should be great for puddles (and hopefully snow!). I also love the fact that the boots can be worn either high-leg, as shown, or unzipped and folded over to create a smaller boot. Personally, I'd buy the camel colour boots as in the picture, however they are also available in Black, Chocolate and Grey. 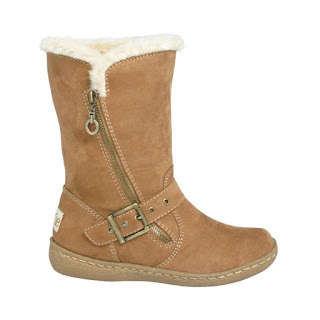 For £64.99 they are slightly expensive, but still cheaper than most Ugg Boots!! Check out these cute books on the Pixie Footwear website. Anyone who is familiar with Studio Ghibli films My Neighbor Totoro and Spirited Away will recognise this cheeky little critter as a Soot Sprite. 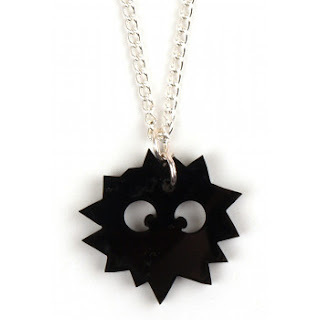 Being the proud owner of a Totoro necklace, and a huge fan of Studio Ghibli films I really need this because it is just too cute! Priced at £7 this is a pretty decent amount for a truly awesome piece of jewellery. Pick yours up from the Jiji Kiki website. It's no secret that I am a huge nail polish-a-holic, and I absolutely love BeautyUK's Posh Polish Collection. At the minute, I am the proud owner of both Sunstone and Amethyst from the collection, and I can not wait to add Funky Diva. Purple is definitely my favourite colour, especially when it comes to nail polish and the fact that it's glittery makes me go a little weak at the knees. First, because I have a real thing for glitter at the minute, and secondly because I don't own any glittery purples, so yay! These polishes cost £3.49 which is pretty good, me thinks. Grab a bottle from Superdrug or the BeautyUK website. What are you lusting after this September?